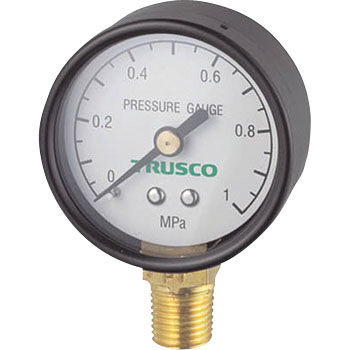 The pressure meter of the air compressor which I used last time bent to a thing and the movement of the pressure meter was bad this time and purchased the TRUSCO pressure meter this time. Personally, I thought there was a sense of luxury more than I thought and it was easy to see the meter well and the meter stopped and there was no leak. It was a product that was personally satisfactory enough without any problems. This review is about item#8373233. This review is about item#8373242. Since the gauge of Monotaro 's filter regulator was attached to the engine compressor, the vibration was so bad that it broke and tried to make it by truss. This review is about item#08373233. I bought the pressure gauge and the compressor switch at the same time, but after repair the pressure setting of the switch and the perfect numerical value were hit. Because I am accustomed to the old kilometer display, I would like to purchase the lift as well. This review is about item#08373267. I replaced it for the regulator. I feel the meter diameter a little small. I am satisfied that there are abundant variations in diameter. I used it for water pressure confirmation. I think that the product itself is inexpensive making. I do not ask for accuracy very much but think that it is inexpensive and useful when you want to use it a lot. This review is about item#08373242. It is a good product that is easy to operate reliably. This review is about item#08373251. Although I was hoping for a monotaro brand pressure gauge, it was purchased as a substitute at the end of handling. Though things can be used normally, the monotaro brand pressure gauge is low price, compact and attractive. I want you to recover.